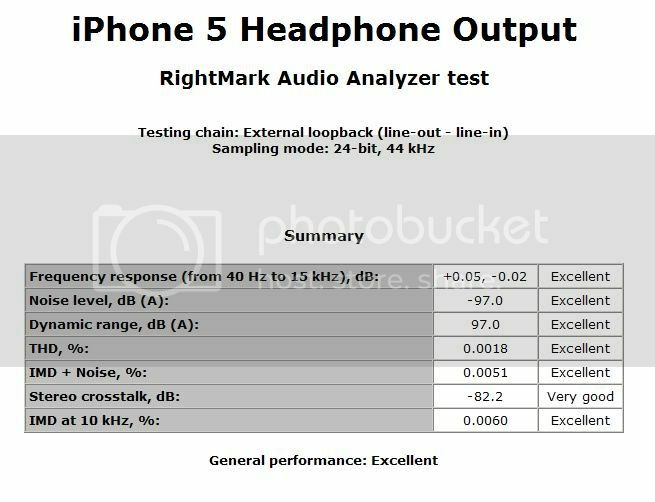 Did a quick Rightmark Audio Analyzer run on my iPhone 5's headphone output today. Unloaded output level (output voltage in this case) is the same as my 3GS. Here's the link to the 3GS's measurement for reference and added info. Below is Rightmark's summary of the results plus a modded quote for my 3GS's results. A. iPhone 3GS headphone output. B. EMU-0404PCI 44kHz/16bit analog loopback. As a CD resolution reference. Same test conditions as the iPhone. 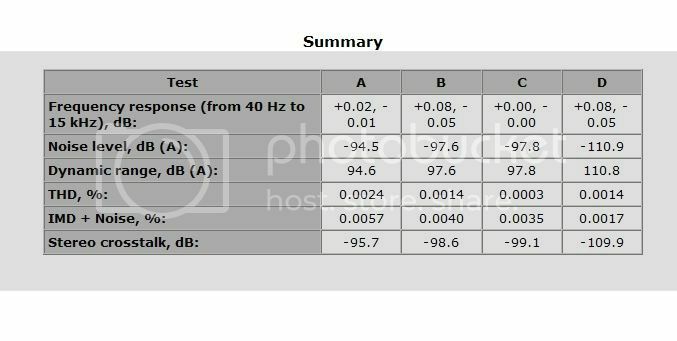 C. This is a perfect 44kHz/16bit test result (same as a digital SPDIF output). Looks damn good! Particularly and most noticeably the noise performance which has improved to the level of the CD format's own digital limit (ie ~-97dB). The separation spec seems to have dropped but that could be due to the new mini jack to RCA cable I am using. Might be flaky, might not. I'll report back on that one. Look at that spread on the base of the fundamental? WTF?! Gonna look into that one as well. I'll can provide a file share link to an HTML file that contains the complete results, if anyone is interested. Last edited by t3sn4f2; 10-19-2012 at 12:39 PM..
Aliasing? What was the sampling frequency? Both the playback test file and analyzing software same rate were 44.1kHz. The spike is normal. That is how the harmonics shows on the graph. 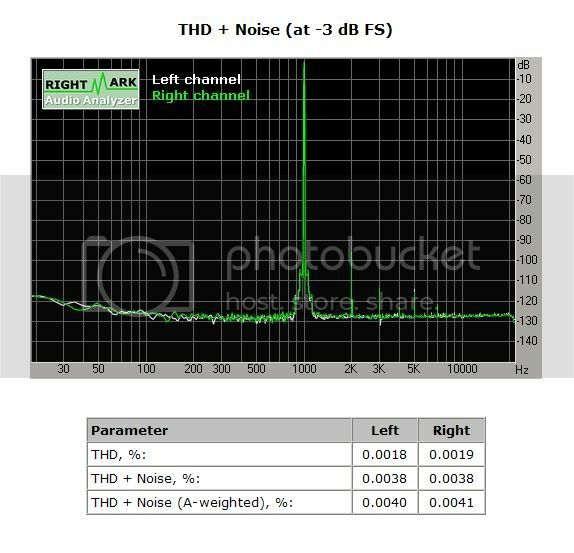 The problem is at the base of the test 1kHz tone. It should be a thin line all the way to the noise floor in that graph's resolution. Last edited by t3sn4f2; 10-18-2012 at 10:06 PM.. Very interesting. I'm getting ready to buy an iPhone and I was actually leaning toward the 4s instead of the 5 for it's smaller size. I'll be following this one.